As a Power Girl I can’t help but notice how people eat. I try NOT to analyze what people eat as much as I do, but I just can’t help it. I think it is because I get SO many questions from people just like you on how to eat. I sometimes am shocked to see how MUCH food people stuff into their body at one time. The reality is that many people are completely unaware of what they are putting into their bodies. Often people eat too much, not only of the wrong thing, but the RIGHT thing too. The other day I saw a girl snacking on almonds. Almonds are a GREAT choice as they are high in oleic acid (a healthy fat) and vitamin E.
The PROBLEM is that she just had TOO MANY of them. Almonds are very high in calories, even though they are HEALTHY calories, compared to the UNhealthy calories in a donut or chips. Now I don’t really want you to count calories Power Girl, but you need to be aware of how much is too much, or how much is enough. It is useful to look into the calorie content of foods from time to time to make sure that you are on track with how much you should be eating. Now getting back to this girl that I was observing…she had about 1 cup of almonds at what appeared to be an afternoon snack (given the time of day it was), which would be approximately 950 calories!!!! Snacking on almonds is great, however 6 almonds (50 calories), is the amount you should be reaching for. I realized that if this girl knew the nutrition facts on what it was she was eating, she would likely have had less and had some water or herbal tea along with a very small handful of almonds, to fill her up. I want to make sure that you know what healthy portions are. Examine the plate above. This is what you are aiming for. So let’s get specific. 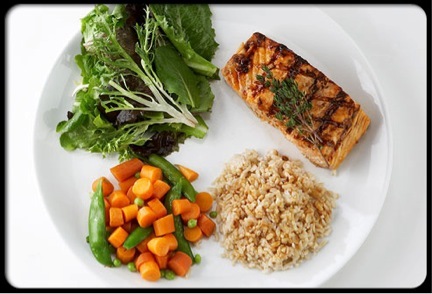 On your lunch or dinner plate, have a lean protein (meat, fish, poultry) about the size of the palm of your hand (the size of 1-2 decks of cards). Your starch should be about the size of your fist (3/4 – 1 cup). Foods that would be considered starch are rice, pasta, potatoes. I recommend going for whole grains or sweet potatoes instead of anything white. You could also try grains like, barley, quinoa, spelt for something nutritious and delicious. The rest of your plate should be loaded with veggies. The key to veggies is to watch the amount of added fats you prepare or serve them with. So tempura (fried) vegetables are not a good choice! Steamed, RAW or stir-fried veggies are a great choice. Last night I had grilled veggies. YUMMY!!! If you want to get lean Power Girl, you will. Remember my Mission is to help YOU make better choices for a better body and a better life! I will help you get to your goal as long as you stick with your Power Girl exercise program and make healthy food choices. The meals and snacks you choose for yourself will help you to reach your goal quickly or slowly. CHOOSE well and remember it is not a race to the finish line. The important thing is that you treat your body well and make the best choices possible because your body deserves it! This entry was posted on Thursday, June 21st, 2012 at 11:19 pm and is filed under blog post. You can follow any responses to this entry through the RSS 2.0 feed. You can leave a response, or trackback from your own site.